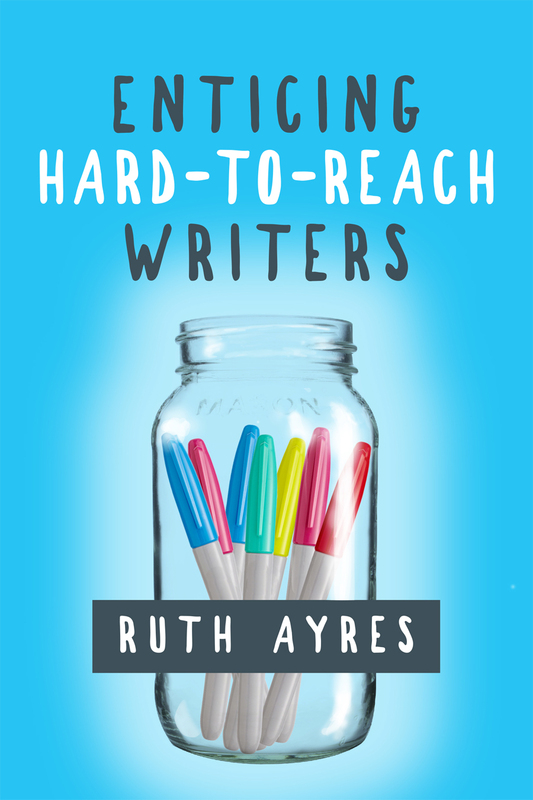 In this moving, personal book, Ruth Ayres weaves together her experience as a mother, teacher, and writer. She explores the power of stories to heal children from troubled backgrounds and offers up strategies for helping students discover and write about their own stories of strength and survival. She shares her own struggles and triumphs and hard-earned lessons from raising a family of four adopted children. Her experience is invaluable to any teacher who’s met children living in poverty, in unstable households, or in fear of abuse. Ruth explores recent brain research on the way trauma changes the brain and makes a case for encouraging all students to write. She believes that all students benefit from revealing their stories, by communicating information and opinion that allows darkness to turn to light in the lives of children. In the last part of her book she offers up practical suggestions for enticing all writers, regardless of their struggles. Enticing Hard-to-Reach Writers invites you on a journey to become a teacher who refuses to give up on any student, who helps children believe that they can have a positive impact on the world, and who—in some cases—becomes the last hope for a child to heal. I think this is one of the best professional books that I have ever read. It is an important book that I think is going to help change the lives of young writers. This book is more relevant today than ever. Kids are surrounded by sorrow and hard times, but writing can be a daily outlet for them to make sense of their world through words. Ruth’s ideas give us the necessary opportunities to help them find their writer's voice. Ruth Ayres's Enticing Hard-to-Reach Writers is mesmerizing, heartbreaking, and heart lifting all in one. Enticing Hard-To-Reach Writers is soul work. You MUST read it.